If you are looking for 'TopSola' panels - I've just heard that they are no longer certified for use in Australia (as of 22 April 2016). Buyer beware - always go for Tier 1 panels if you can. Topsola’s manufacturing lines and commercial offices are located only in China, meaning that Australian customers won’t be able to get in touch with any local office, should they have any particular enquiry or technical issue. 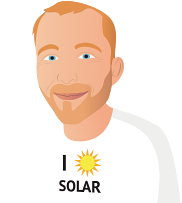 If you want to know more about Topsola’s range of solar products, read the reviews here below from customers who bought their solar panels in the past, or have a look at the photovoltaic systems listed on this page to find the ones that best meet your needs and requirements. Made an excellent choice. Could not be happier ! We had 20 x Top Sola 250w Solar Panels installed to generate 5.0kw. These panels have a 12 year product warranty and 25 year performance warranty. On a sunny day the Growatt Shine Vision Monitoring Device shows we are generating something over 3kw but never 4.0kw yet. Usually we generate substantially less - I'm not overly concerned that we are not generating 5kw as there are so many factors involved - clouds, trees etc. - but I'm very glad we didn't install a smaller system. It would be really useful to have a monitor that worked (see below!) and connected to a PC and graphed on a weekly basis how much solar power we are generating, how much we are using of what we generate, how much is going back to the grid, and how much we are drawing from the grid. Slight drop in power during the second 12 months, but that might improve when I clean the panels - which I plan to do soon. Rated 3.0kWh..................but even on the best of sunny days they produce no more than 2.8kW On a good day they produce up to 18-20 kWh all up. So far so good with absolutely no problems with either the equipment or installation.